Laura Shaeffer is an artist-organiser cultural producer, and informal educator based in Oak Park, Illinois since 2016. 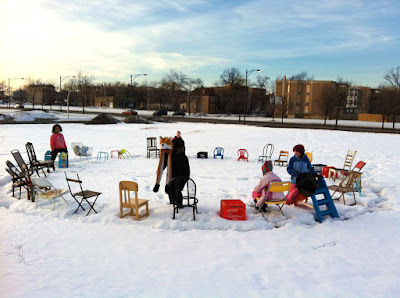 Over the past 20 years, she has worked alone and in collaboration on numerous projects housed within unconventional and often underutilized spaces on the South Side of Chicago, including Home Gallery, The Op Shop and Southside Hub of Production (SHoP) and now, in Oak Park, Compound Yellow. She specializes in developing collaborative networks in the arts and other creative endeavors. "Her approach is a combination of activism and common sense; community building and home-making. She honors domestic spaces as sites of radical, informal pedagogy, and this manifests itself in an important through line that runs across her projects; they act as platforms for kids to express their creativity and imagination, and indulge their curiosity. 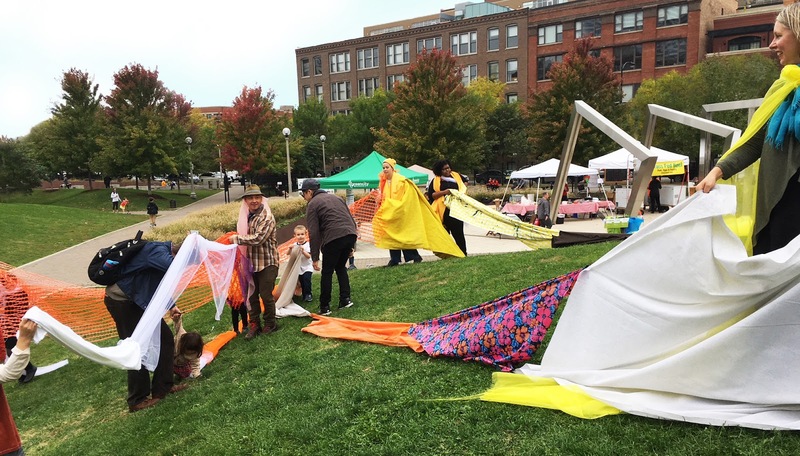 Alongside immersing them in art and cultural production, an important byproduct of this is kids’ engagement with other kids, families, neighbors and neighborhoods. By remaining open, nurturing organic expansion and leveraging intuition, Shaeffer stewards growth rather than shoehorning artists into rigid themes or mapping them onto discrete timelines." Cultural ReProducers is thrilled to share this interview with Laura conducted by artist and art historian Rachel Epp Buller, whose recent research has led her to investigate care, correspondence, and domestic art spaces as creative practice. CR: As a 'Cultural ReProducer,' what would you like to share with us about your family? Laura Shaeffer (third from the left) and family. Laura: My husband, Andrew, and I have two sons, Jasper now 16 and Sebastian almost 14, and a very sweet but challenging Bull Terrier, Shelby. 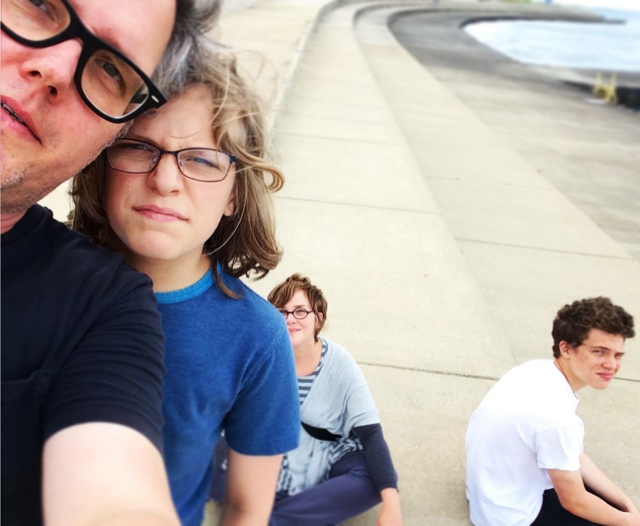 I think most every project I’ve been involved in since becoming a new parent has been inspired by my children's surprising perspectives, needs, and honest responses to the conditions of their lives. They are both introverts like their father, extremely creative and critical people who have more or less gone along with my crazy ideas and strategies for how to work with whatever you have to create a world in which you want to live. 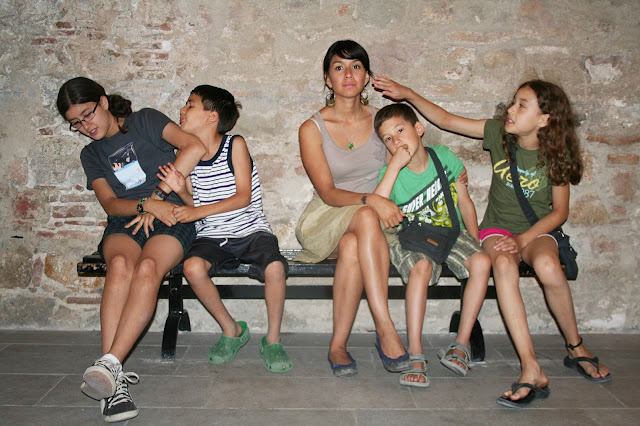 When I moved back to the U.S. from Berlin, where I had been living for many years, I experienced culture shock and felt very isolated, and having children initially increased that sense of isolation and feeling alienated from the art world. To address this issue, we decided to open our own home in Hyde Park as a “gallery,” a place to gather, meet other artists and get to know our neighbors. It was at that point that I began to see my kids and other kids as collaborators: with their spontaneous and unbridled curiosity, their ridiculous gestures, and their brutal honesty, they became at times Fluxus mentors, instigators, guinea pigs and my hardest critics. I realized the more I tried to be a “good” parent and do what “good” Moms are supposed to do, the worse it was for my kids. I had to find a way, or multiple ways, to combine creative practices with parenting, and this led to HOME, our first project together. CR: You've experimented with a number of different types of alternative arts spaces. Can you tell us about the different motivations behind HOME, The Op Shop, SHoP, and Compound Yellow? 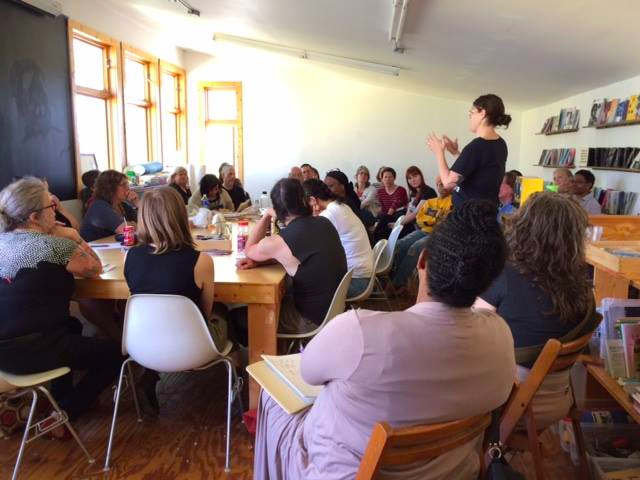 Laura: I think finding creative ways of meeting unmet needs in our neighborhoods as well developing strategies for finding collaborators and new connections between people is the common motivation behind all these projects for me. Also, I love art experienced in unconventional places. The first project space we opened in 2000 was in a dilapidated old department store above the Arc Thrift Store; we called it CAN Gallery. For one year we invited local artists (mostly young students) to exhibit and interspersed these local shows with exhibitions of Berlin-based artists. The motivation here was to ease the culture shock of moving back to the U.S. after 13 years in Europe and to find new connections with artists in Chicago. The second project, HOME, we started 3 years after moving to Hyde Park and after having two small boys. The motivation was to build a creative community where you live. I invited all of my neighbors, kids, families, older people and artists from all over Chicago and beyond. We ran HOME for 7 years and had at least 12 exhibitions. Through this experiment we met so many people living in Hyde Park and so many artists living all over Chicago. In this sense it was a very fulfilling experience. In 2009 Hyde Park was riddled with empty storefronts; I wondered why there were no independent galleries or independent cultural projects here so I decided to find a public space to make one. I approached Mac Realty with an offer to clean up and care for an empty space for one month for $1, returning it in better condition when I left. 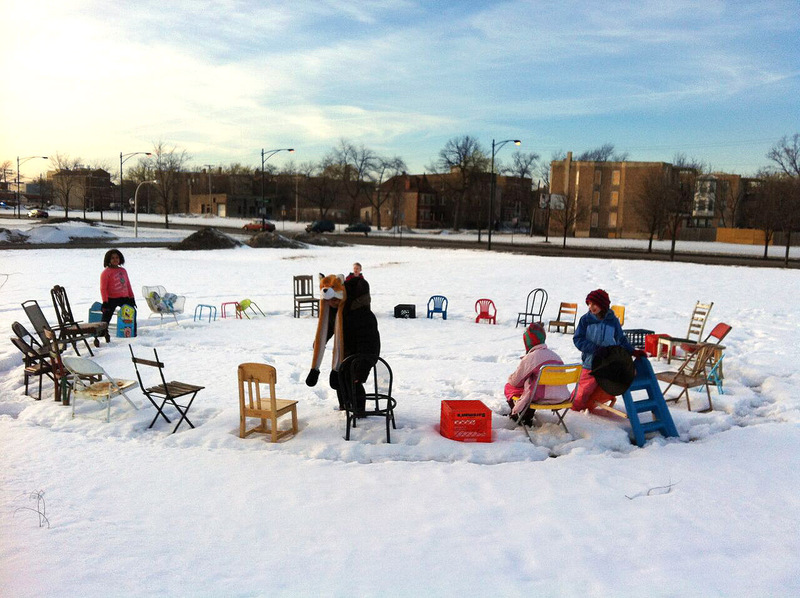 This was the start of a series of experimental cultural projects that moved all over Hyde Park. The Op Shop had a sense of freedom and fluidity: each Op Shop had a strategy or theme, and for most of these I worked in partnership with a different artist. It became a way to informally research the neighborhood of Hyde Park and the broader South Side. Op Shop opened the door and paved the way to a bigger and more ambitious project that developed with the opportunity of renting a 16-room mansion, the Fenn House, near the University of Chicago campus. In 2010, SHoP (Southside Hub of Production), was conceived by a small group of forward thinkers and artists including John Preus, Eric Peterson, Mike Phillips, and myself as a place to stimulate local cultural activity, provide spaces for artists and neighbors to work, perform, exhibit, collaborate and socialize, and for relevant community programming. SHoP became a vital cultural and social hub for all ages. For the 15 months of its existence, SHoP continued to enjoy that fluid, flexible and organic quality of the Op Shop but the question of sustainability loomed over us as Hyde Park became more and more gentrified. Fenn House was put up for sale in 2014. 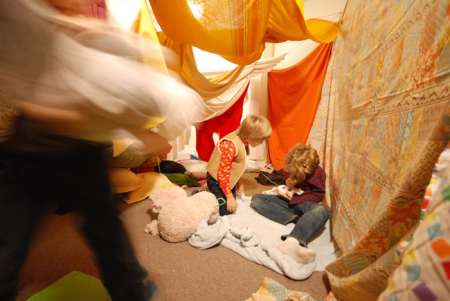 CR: How did your children react to living with art in their home and to having their home double as a gallery space for the public (at least periodically)? Laura: I think they had mixed feelings about all of it. Their views and memories change over the years. On any given day, they may say something like: "I don't know, it was fun I guess," or "No, I loved it, it was cool being around all of those artists and doing crazy things," to other less favorable responses that I have had to pay attention to, like "I just want to have some privacy and I don't care about art or any of this!" CR: I read that part of your vision for SHoP was to offer an after-school space for kids - a kind of community maker-space. Can you tell us more about that, and how it worked? And does that element, of serving younger audiences as well as adults, continue in Compound Yellow? Laura: We set up a space in the Fenn House that we called the Autonomous Making Space. collected donations of all kinds of materials and bought tools for the kids to use to make things out of wood and other stuff. We tried to set it up for families and latchkey kids to come in and work anytime we were open and put things back in their places to keep a sense of communal order. (That order part didn't work out terribly well, which became the impetus for a wonderful project by Jorge Lucero, educational prompts and placards for the Autonomous Studio). mother, a devout educator for over 50 years, inspired a love of and passion for education in me that is behind all that I do. She brought me to conferences with her on topics of multiple intelligences, alternative pedagogy and radical philosophies of education as a young child. I used to volunteer in my son's classroom on Fridays, bringing unusual materials in for the kids to work with; they didn’t have art in school then. They loved making their own new worlds from straws, clay and broom bristles, for example. The results were unimaginable and wonderful. Later when the kids got a little older, I started an after school program that ran from 2011 to 2015. We used an empty apartment and called it HOME SCHOOL #3, part of much larger project with other iterations and locations. We also used the basement of the Quaker House for some time. The idea was to fill the spaces with donated materials and allow the kids to freely engage with them in an open and creative environment. The adults (artists, actors, writers, filmmakers) acted as facilitators and collaborators, allowing themselves to be led by the desires and ideas of the children. It was an awesomely inspiring time for us all. I also co-ran summer camps with artists like Matthew Searle, Jerry Marciniak, Spencer Hutchinson, Hoyun Son, Dan Godston, Nitsana Lazerus and so many more for years in Hyde Park. We had kids ranging from 3 to 13, a very diverse group; many of the same kids came every summer. It was a wild and memorable ride, and one of the most significant projects in terms of mothering as an artist. My own kids of course took part in these camps, which was also a way to be with them and provide for them when school was out. By the time Compound Yellow started, my kids were already teenagers and Oak Park was all new to us. Naturally, I am more interested in older kids and their needs and what they have and don't have to meet them. We did try a camp here last year called Camp Yellow, led by Raffa Reuther and inspired by the Self-Reliance Library by Temporary Services, Brett Bloom and Marc Fischer. The library and the camp encompassed all sorts of topics: “visionary architecture, desperate or wildly imaginative mobility, miniature buildings and nomadic living, self-publishing and design, skill sharing, everyday repair solutions, running a music venue, spaces for parenthood, toys and design for children, ecologically sound living, foraging, blueprints for fantasy worlds and alternate realities, pranks and mischief, technologies used in prisons and other restrictive or impoverished settings, survivalism, weapons for self-defense or recreation, and creative approaches to living radically.” It was nice for the kids but being new to Oak Park, we decided to wait until we really knew what we were doing at CY before launching another camp scenario. Also, I now have a full time job, and my kids do not want to do camp with me or anyone else. CR: Your current space, Compound Yellow, is on the same property as was formerly occupied by the Suburban, a domestic gallery run by Michelle Grabner and Brad Killam, but it doesn't seem like you've just picked up where they left off when they moved. How do you see your aims for your space, and your motivations for running it, as distinct from what they did with the Suburban? Laura: This is an interesting question and one that we think about a lot. In terms of our family, each person had a different vision for this move: Andrew wanted a hermit hut, a place of his own; Sebastian never wanted to leave Hyde Park in the first place, but being a realist, and after making a few friends, he’s decided to build a chicken coop on the side yard with his dad and get on with it; Jasper wanted to find a place to be himself and new friends who accepted him. I wanted a space to cultivate a project with time, to stop moving for a while. I also wanted to share space, to create a kind of art commune, and to work collaboratively with others. We have all learned a lot since moving here. This desire for collaboration and community seemingly differentiates us from the Suburban's aims; however, what we share in common is significant. As soon as we moved here, we were welcomed by the art community in Oak Park. 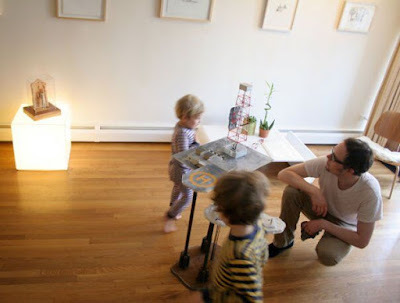 I'd like to express gratitude to artist and organizer Sabina Ott, who played a special role in connecting me with Lora Lode and Matthew Nicholas through her own domestic project, Terrain Exhibitions, and the 4th of July Terrain Parade. Thus began my collaboration with Lora and Matthew on this project, Compound Yellow. We're now in the process of applying for Not-for-Profit status. 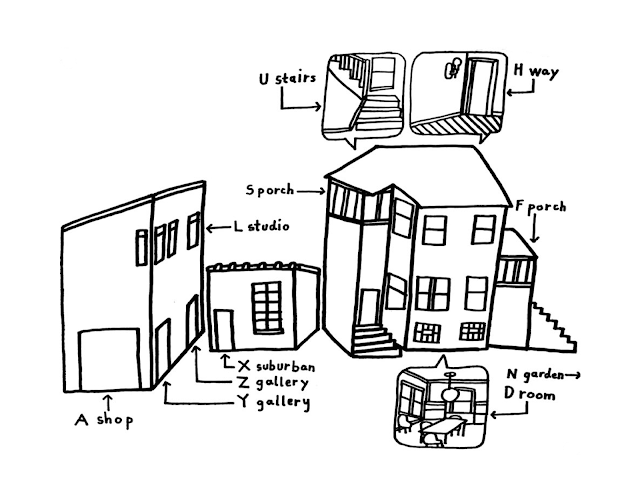 What inspired me personally about the Suburban is the concept of an “uncurated” space where artists are in complete control of what they produce and the criteria for what made for a successful show, according to Michelle Grabner, was "if the artists learned something about their own work from their relationship with the space, and the suburbs." We also don't sell work here or charge money for events or workshops. We are most interested in using the site as a place to prototype ideas, to cultivate sharing economies, participatory art, and interdisciplinary explorations. There is a generosity here that we inherited when we moved in: the prairie garden is so wonderful, the studio, the windows, the light, the tree, the sweet side yard, the little cinder-block hut. All the decisions made before we came along are greatly appreciated by us every day. In many ways we are connected to the Suburban and are supported by Michelle. I am inspired by what I see happening at The Poor Farm and see connections to what we are doing here as well. CR: What have you learned about yourself, your family, and/or your artistic motivations through these projects? Laura: What have I learned about myself through these projects? I’ve learned that I am a natural connector, that I love watching things grow; plants, people, kids, fires... minds. I’ve learned to be more flexible, to listen more and to know when to let others take the lead. I’m just beginning to learn how to take care of myself, to be a participant, to support others’ projects by going out and meeting people where they are at, not just inviting them to my house! What have I learned about my family? I’m learning to give them space and to let them gravitate to what really resonates with them. To not push them to participate in what I’m doing if they don’t want that, and they usually don’t these days, but that’s okay. I’m learning to honor their needs as those needs change, and it’s not easy. I continue to be inspired by artists like Alberto Aguilar, Christa Donner and Jorge Lucero, for example, who work with their families creatively in their practice; this is my motivation. What have I learned about my artistic motivations through these projects? I've learned about collective creativity and intelligence. I think these kinds of intergenerational spaces help us find in others an extension of self and family, to rely on collective creativity to raise consciousness around what it means to be in a community where we all participate in raising our children together and trying to find meaning together. I guess I want to make everything an art project: the house, the yard, the street, the subway, the grocery store, work, family and relationships. Dr. Rachel Epp Buller is a feminist printmaker book artist art historian university professor and mother of three. Her artistic, written, and curatorial work addresses these intersections, focusing on the maternal body and feminist care in contemporary art contexts. Her books include Reconciling Art and Mothering and a forthcoming volume on Inappropriate Bodies: Art, Design, and Maternity. She is a board member of the National Women's Caucus for Art and a regional coordinator of The Feminist Art Project, and currently serves as Associate Professor of Visual Arts and Design at Bethel College.